Hello! 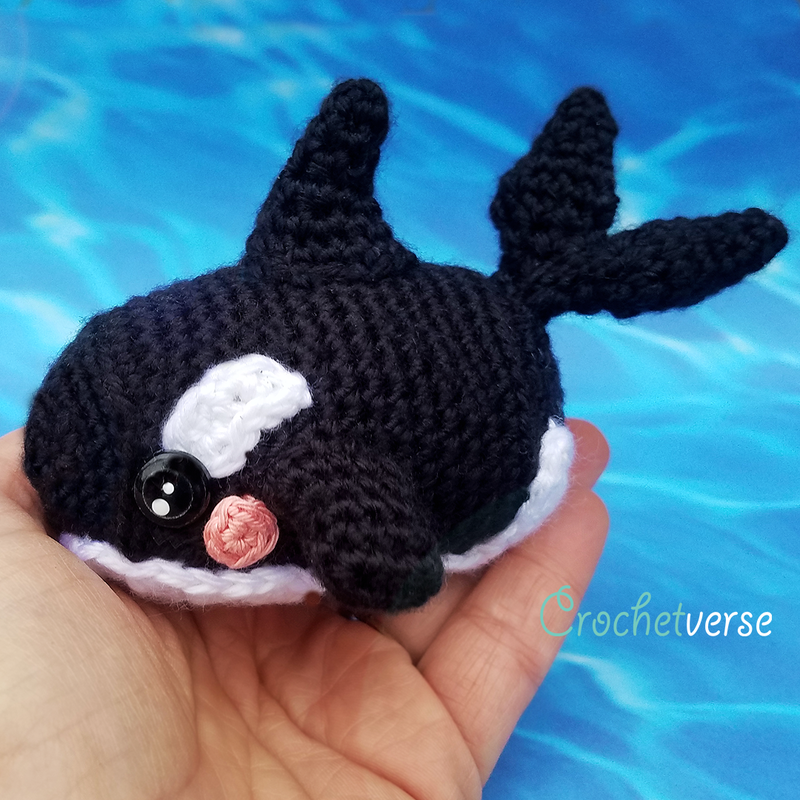 Welcome to the “ORCA WHALE CROCHET ALONG! So happy to have you join us! My name is Stephanie Pokorny, the owner and designer behind Crochetverse! I love to create and share my patterns with all of you and cannot wait to begin working with everyone! 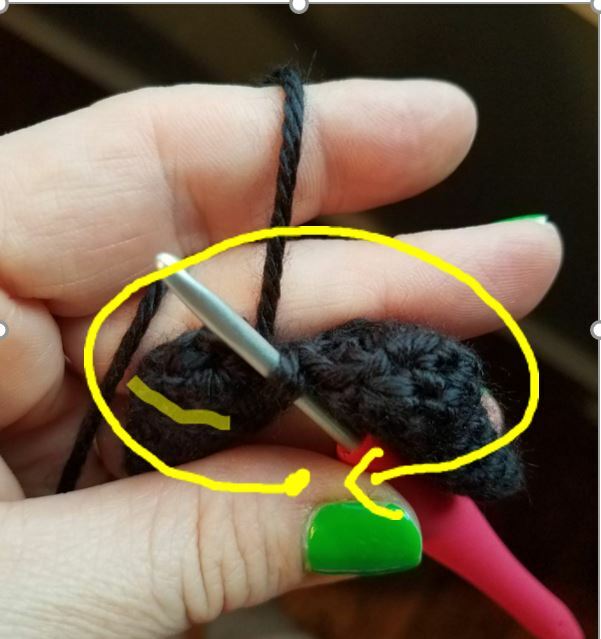 I have been blessed to have the amazing Facebook group, “CAL – Crochet A Long” group help me bring this to you. They have tested, tweaked, suggested, and translated for me in hopes that this will be a purely enjoyable experience! Hugest of thanks! 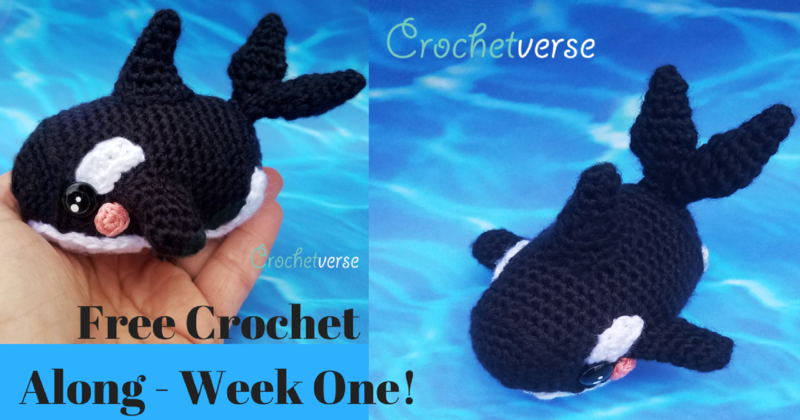 We will work over a 2 week period to create this sweet little Kawaii style Orca whale! 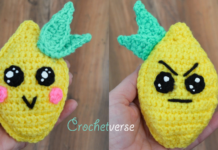 If you have never done amigurumi, now is the time! 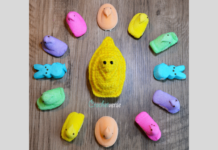 You will get the chance to work along with other crocheters and ask question as we go to “de-mystify” amigurumi! Learn tips, trick, and hints that will carry into your future pieces too! *Yarn note: Shown is Caron Simply Soft in Black, White, and DMC Floss in a peachy pink. Though Caron Simply Soft is marked 4/Worsted, it is much closer to a 3/DK weight yarn. If you use something such as Red Heart Super Saver, your item will be larger than stated. Another good choice is “Hobby Lobby I Love This Cotton.” In the UK Stylecraft Special DK is also very good to use. If you use regular yarn for the rosy cheeks, you will want to separate the 4 plies of the yarn and only use two of them. They need to be delicate so as not to overwhelm the face. SAFETY NOTE: If this item is intended for a young child, please eliminate the button eyes and insted follow the instructions given to crochet them. *Eye note: I have used ½” black glass buttons and painted the little white dots on using nail polish and a toothpick! As written, measures 5” (13cms) long by 4.5” (11.5cms) wide by 3.5” (9cms) high including all the tails and fins. I like to make the tension part of the pattern. After Round 6 of the main body is completed, the circle should measure 2” (5cms) in diameter. While it is not imperative you meet tension, you DO want very tight stitches to avoid gaps in the work. Amigurumi needs to be TIGHT! If your circle is LARGER, you have looser tension than I do: Go DOWN a hook size. If your circle is SMALLER, you have tighter tension than I do: Go UP a hook size. If you are using safety eyes as opposed to buttons, you will want to attach them now. Reference the photo of the completed Orca for positioning guidance. Before working final row add more stuffing. Fasten off, leaving a tail to sew any remaining hole closed. Shape into a tube as needed. *Be sure your work doesn’t flip to the wrong side during the 1st few rounds. If it does, work it back to right side with your finger. Tuck all the tails inside the tips so they are hidden. Do not stuff the tip pieces. Position the 2 tip pieces next to each other with the final round 7 facing up with the 2nd tip (the one you have not fastened off) to the right and the fastened off tip to the left. You will be working the 12 dc that make up the tip pieces (6 from each) as ONE ROUND to join them. This image shows the two tips lined up and ready to join just before round 1 of join base. The arrow shows the direction to work the 12 dc around the two pieces. Both side of the beginning chain are worked on this piece. opposite side of the chains and sl st along the next 3 chain loops, sl st to the 1st st made, fasten off leaving tail for assembly. Rnd 1: work 5 dc into the ring, sl st to the 1st dc made, fasten off leaving a long tail to sew to the face later. 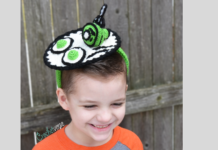 Stitch on the white “eye sparkles”: Using a strand of white yarn and a needle, stitch 2 dots on each eye piece. One should be larger (two or three times around one stitch) and sit in about the 7 o’clock position. The second should be smaller (one or two stitches around one stitch) and be just below the centre of the magic ring centre. The tails from the white eye sparkles can be knotted and trimmed behind the eye, as they will be stitched on the body and covered. Rnd 1: 6 dc into the ring, pull tail to close, sl st to 1st dc made, fasten off leaving a tail for assembly later. Row 14: ch 5, turn, dc in 2nd ch from hook and next 3 chains, dc in each of the 5 sts across the centre row, ch 5. (LOOSELY) across the next 4 dc. FASTEN OFF, continue to the EDGE ROUND. The right side of the piece should be facing up. If not, turn it so the right side is facing up. Ch 1, dc in each st and end of rows around the piece to edge the tummy, work 2 dc in the corners as you round them to avoid warping, sl st to the 1st dc made, fasten off leaving a long tail for assembly. Hooks down! That is it for this week! Be sure to join us next week to put it all together!